After 37 years in global markets, there is nothing that excites Keith Fitz-Gerald more than cold, hard cash. Especially when it comes to helping everyday folks tap into piles of potential money usually reserved for super-rich tycoons. That's why he's putting all the secrets out on the table in his new book, "Crazy Big Income." They're bound by strict rules to present you only middle-of-the-road, plain vanilla dividends and low-paying bonds. He knows because he's seen firsthand, time and again, how "smaller" clients get locked out even as Wall Street insiders give preferential access to the fat cats who seem to play by an entirely different set of rules. For the past 12 years, he's used his knowledge to advocate for "regular" investors with modest portfolios. 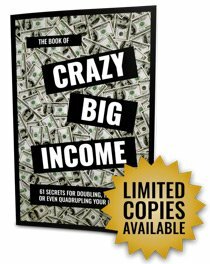 But that's all changed with this book: "Crazy Big Income." Of course, a lot of people won't like him coming out with these secrets. Because many of them are on a first-come-first-serve basis. And you may end up locking out some of America's most elite clients. But who cares, when the money can start rolling in? The value of the income secrets you'll find in this book could boost your annual income well into the six-figure range… maybe even higher.